Grab your Discounted Lock Pick Education Set while the store LAUNCH DISCOUNT is on. Once we reach 300-unit sales, we will be increasing the price back up to $63.95. This is absolutely a great gift! This Lock Pick Education Set is specially designed to let locksmith beginner have a better understanding of how to unlock a padlock. A transparent padlock with open chambers on all the moving parts that allow you to see how it works. Besides knowing and exploring the padlock, you can try to pick this transparent padlock, which is a perfect starter kit for anyone interested in learning the art of picking locks. This transparent lock works exactly the same as a normal padlock, you can even see how each of the lockpick tools works differently on the lock. Complete Set: You can now train yourself to be an expert locksmith with the 15pcs complete kit set. 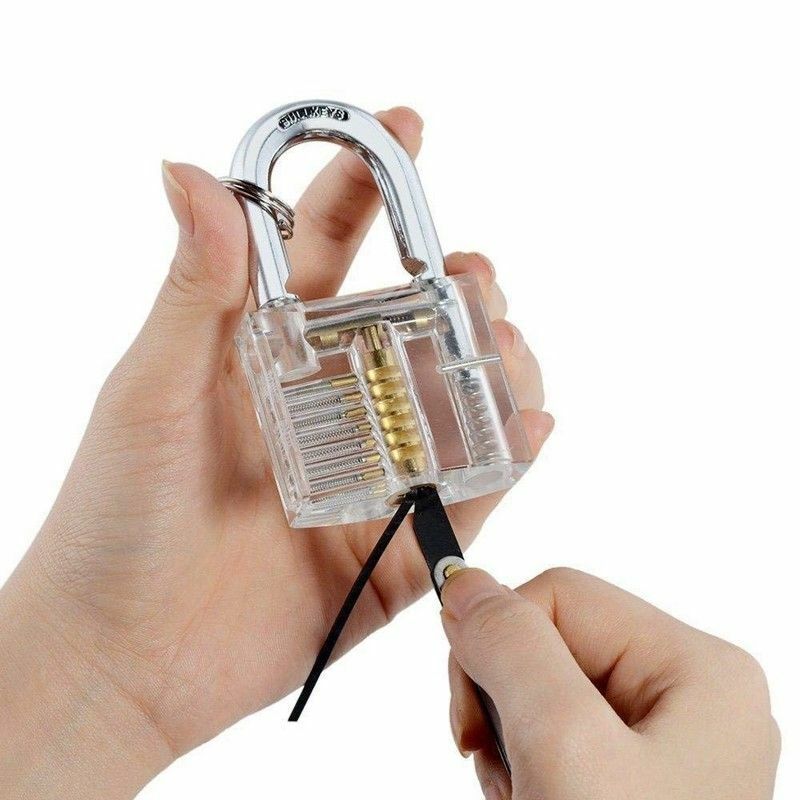 Transparent Lock: Allows you to see how the lock works on moving parts, you can see clearly how the pins work when a key is inserted, it helps you know the mechanism of the locks, very useful for beginner locksmith to train. Nice quality. The picks need some deburring with sandpaper because of rough edges, but otherwise everything is good. Very high quality. I thought when I ordered the kit that the lock would probably be cheap, but to my surprise, it was built very well. It even has a seven pin configuration. If you can rake/pick this lock, you for sure can pick a five pin door knob lock easily. Definitely worth the money.